Frosted Blog – Tech and Dress run. Hey everyone, Jack here to fill you in with all the shenanigans from this week’s tech and dress run. I will be playing the part of the reindeer with the wonderful Debbie, a role I was determined to play ever since it was announced at read-through. We started the week off with the tech run on Monday. This was the first somewhat full run we had on the Intimate stage so some tweaking and adjustments were needed from the usual Canon House layout we were used to. This was also the first chance our stage team had to get to grips with all the set changes throughout the play and I must say they did a great job. By the end of the rehearsal we were having to skip through scenes so we didn’t go over the Intimate’s 11 o’clock noise rule, but in the end we got everything finished. We were pretty much all set for the final rehearsal. Tuesday’s dress rehearsal went pretty much without incident. Everything ran fairly smoothly, which considering it was the first full uninterrupted run with band, lights, set and mics is quite an achievement. All numbers look and sound amazing, especially the act one finale, “let it go”, which I say will live up to the Disney version. The writer of Frozen, sorry I mean Frosted, Warren McWilliams was in the audience and hopefully he was as pleased with the production as the cast and creative team are. Doing this panto with SMP has been a great experience and something I have been meaning to tick off my bucket list for a while now. Having never done a pantomime in my life I thought this was as good an opportunity I would get to perform in one with a great script, great songs and a great cast. I would just like to say thank you to everyone for making this a wonderful 4 months. Hope you all enjoy watching it as much as we enjoy performing it. It’s sure to be a nICE watch, don’t give us the cold shoulder and purchase some tickets. 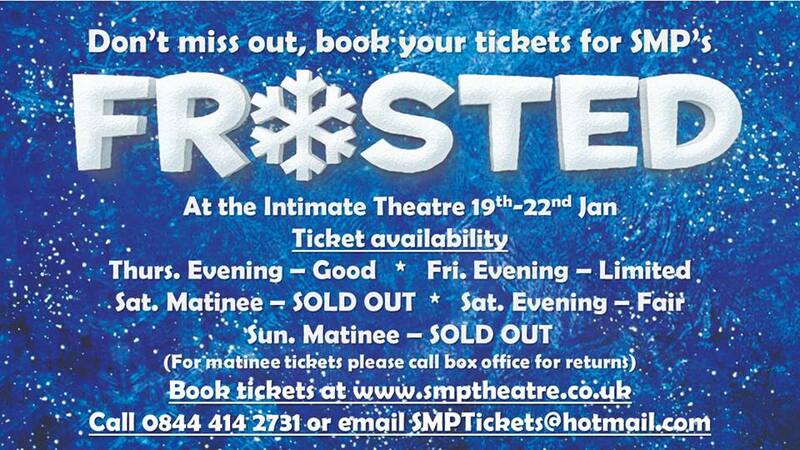 We do have some returns for the matinee so please please ring 0844 414 2731 Or email SMPTickets@hotmail.com for availability.